Matthew Cook is one of the greatest reportage artists today. He began his career by studying illustration at St. Martins School of Art and Kingston Polytechnic. After college, he worked as an expedition artist to Operation Raleigh, travelling to New Zealand, Australia, Papua New Guinea and the West Indies. Fairly early in his career, Matthew was commissioned by the Royal Mail to record events such as Royal Ascot, Henley Regatta and The Highland Games into a set of five commemorative stamps, and a book “The British Season” by Pavilion Books, which rapidly sold out its entire edition. 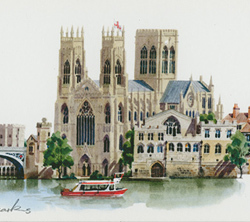 Matthew has now become very well known for his works in both watercolour and in coloured inks. He work is regularly featured in leading British newspapers including The Times, The Guardian and The Telegraph. As a distinguished British artist, his work is in high demand worldwide by professional clients and private collectors alike.